Gut bacteria. Are there any two words that are less appetizing? Probably not. And yet, that’s what people are talking about these days. What are they eating while they’re talking about gut bacteria? Fermented foods. Because while fermented foods have always been popular for their flavor, they are also popular for their gut-healthy bacteria. Now, we’re not here to espouse the health benefits of foods that promote a balanced and diverse gut microbiome. In fact, the phrase “balanced and diverse gut microbiome” rarely, if ever, passes our lips. But foods that have a positive effect on health beyond basic nutrition are a big deal right now. And we’re happy that these delicious foods, health benefits aside, are getting the food trend attention they deserve. First, what happens to food when it’s fermented? Fermentation is a metabolic process in which natural bacteria consume the sugar and starch in a food creating lactic acid and beneficial probiotics as a by-product. Translation: Food sits in a dark, airless container while bacteria transform it into a stinky, tasty, and healthy treat. These are some of our favorite fermented foods from the gut-health trend. The yogurt section in the grocery store has grown considerably in the last few years—for good reason. Not only is yogurt delicious and versatile, but it also contains beneficial, natural probiotic cultures. Read about how FDR’s Chef Katie Sutton and other chefs are using yogurt this year. 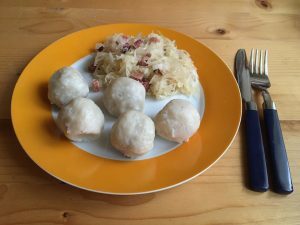 Sauerkraut is fermented cabbage and salt. From these humble ingredients comes the condiment and side dish that is loved internationally. Make sauerkraut in-house using any number of vegetables and spices, and serve it with charcuterie, dumplings, in dressings, and even in cocktails. Kombucha is a beverage produced by fermenting sweet tea with a culture of yeast and bacteria. It has a slight vinegar taste and as a result of its fermentation process can contain small amounts of alcohol. Many restaurants are keeping kombucha on tap and are using it on their drink menu. Miso is a traditional Japanese seasoning produced by fermenting soybeans with salt, a fungus, and sometimes rice, barley, or other ingredients. Miso is incredibly versatile, adding salty-savory-umami-packed flavor wherever it goes. Try it on roasted meat or vegetables, in sauces, soups, and to balance out the sugar in sweets. Kimchi is a traditional Korean side dish made from salt and fermented vegetables, typically napa cabbage and Korean radishes, and seasoned with a variety of seasonings including chili powder, scallions, garlic, ginger, and jeotgal. 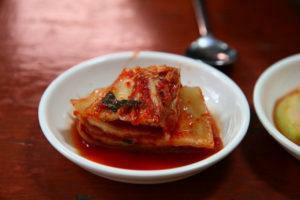 We’ve written about kimchi before. We love the spice and complexity it brings to every dish. Will people always be talking about their gut bacteria and digestive systems at the table? We’re not sure. But in the meantime, would you mind passing the kraut? The sour taste of sourdough bread is caused by the lactic acid released during fermentation. Not only does it taste great, but some folks with gluten sensitivity are finding they can tolerate sourdough bread. Perhaps that’s why we’re seeing more restaurant concepts around sourdough. Read more about what’s coming up in the culinary world with the latest in FDR Food & Beverage Trends!